Betty Aiken has had a dream to share her knowledge of herbs and their medicinal properties in the form of a book for many years. At 86, it seemed that this dream would be unrealized until a long-time friend Bev Wilkinson stepped in to make it a reality. Betty studied Herbology as well as Anatomy and Physiology, before eventually receiving Professional Status from the Ontario Herbalist Society. In 1991, she was honoured by being named the first OHS Herbal Healer. Betty has years of acquired knowledge of alternative remedies to common health problems. With the help of Bev and family members they compiled the many natural remedies and preventative cures that Betty had acquired over the years. A rough draft of the book was provided to QwikPrint, the printing division of The Technology Centre for formatting, editing and production of a small-format book. The final result was a 60-page, half-size book with illustrated cover. The book was launched at The Good Health Mart in Owen Sound on October 17th and the first 100 were sold within a couple of hours. Successive additional printings have sold similarly well. The problems Betty faced getting her book produced are common when publishing specialty books. Generally, publishers/printers require a minimum production of 500 books and have expensive setup costs making it cost prohibitive for many people. If you are planning to sell the books, it’s good to test the market first with a small printing rather than commit to thousands of dollars and have them sit on the shelf. QwikPrint is able to accept either initial drafts in a variety of file formats or print-ready versions and produce as few as 50 copies. Printing on a digital press allows production of a complete finished book so it is possible to see exactly what the final product will look like. Digital print production is not only fast (a typical turnaround time is 48 hours) but almost very cost effective because of the reduced setup requirements. Once a book is printing, it is stored digitally and ready for reprints at anytime. Small-volume book production is becoming increasingly popular with writers, photographers and graphic artists wanting to put their work in print, commonly for smaller select audiences. The advancements in digital printing and automated production methods have this more affordable and faster. 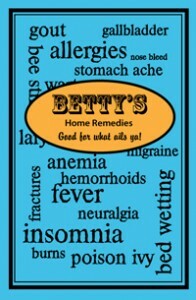 Betty’s Home Remedies is available at Owen Sound’s Good Health Mart.